This interesting surname, with variant spellings Onians, Onion, O'Nions, and possibly Ennion, Onyon, and Anyon, derives either from the Olde French 'oignon' and denotes a seller or grower of onions, or the Olde Welsh 'Enniaun' meaning 'the Anvil'. There have been claims as well that it is Huguenot, and indeed this is correct, but that fact does not alter the origin of the surname. It has also been claimed as an Irish surname, but that is really taking things too far, although branches of the family, originally protestant settlers, were recorded in that country. One variant of the surname is now recorded as O'Nions but this would seem to be a little bit of 18th century 'yuppyism' (like the surname O'dell) designed to take the meaning away from its honest origins. 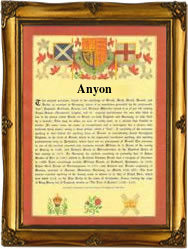 That the name has always been held in good standing is shown by the grant of arms. This has the blazon of a red field, a chevron ermine, between three gold mill rinds, and the crest of a hand holding a spear. Examples of the early recordings include Robert Oygnoun in the 1295 rolls of the town of Hastings in Sussex, and Robery Onnyon in the Subsidy Rolls of Suffolk in 1524, and Raphe Anyon in the register of the church of St Lawrence Jewry, London in 1552. Thomas Oynion and Thomas Onion were both recorded in Suffolk in 1686. The first recorded spelling of the family name is shown to be that of Thomas Onioun, which was dated 1279, The Hundred Rolls of Cambridgeshire, during the reign of King Edward 1st, known as 'The hammer of the Scots,' 1272 - 1307. Surnames became necessary when governments introduced personal taxation. In England this was known as Poll Tax. Throughout the centuries, surnames in every country have continued to "develop" often leading to astonishing variants of the original spelling.